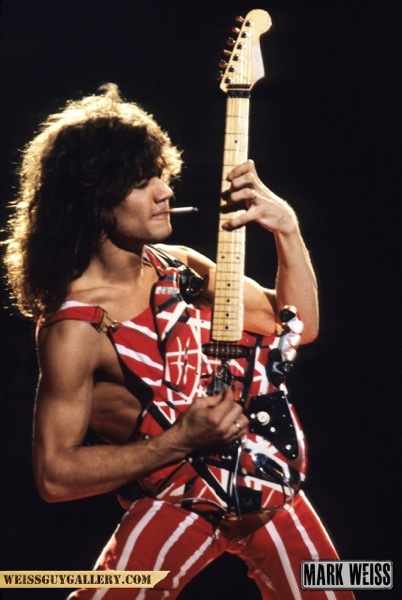 Mark Weiss has been auctioning his classic photographs to benefit Lunch Break, the soup kitchen in Red Bank, NJ. At a Lunch Break fundraiser, David painted live from a photo of Elvis. David’s unique execution of the image caught Mark’s eye. 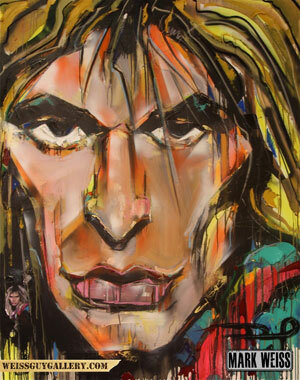 The two had an idea to have David paint Mark’s most iconic rock ‘n’ roll images. Both men, as artists who create visuals live, and in the moment, want their work to help bring focus and funds to charitable causes. These two artists just returned from their first successful collaboration at NAMM for Guitar World Magazine’s inaugural roast of Zakk Wylde. Three months ago when Banegas and Weiss shared an idea to collaborate their passion for music, art and “giving back,” neither dreamed it would come together at such a high profile stage so quickly. 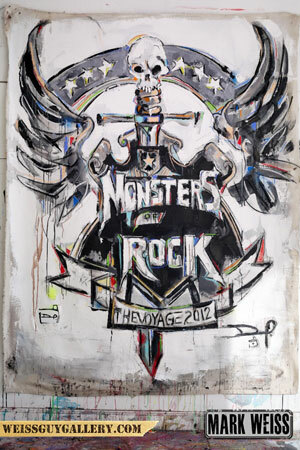 As the guests arrived via the red carpet to the sold out event, attendees passed by the portrait of Zakk Wylde by photographer Mark Weiss and the mirror image was being created “live” by artist David Banegas. 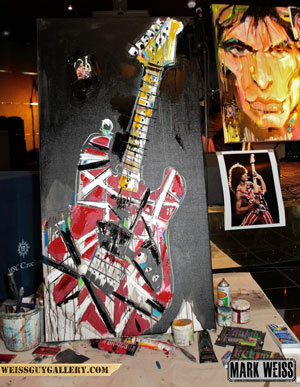 David also painted “live,” Zakk’s Epiphone Signature Les Paul guitar on canvas, which will be auctioned off for MusiCares. 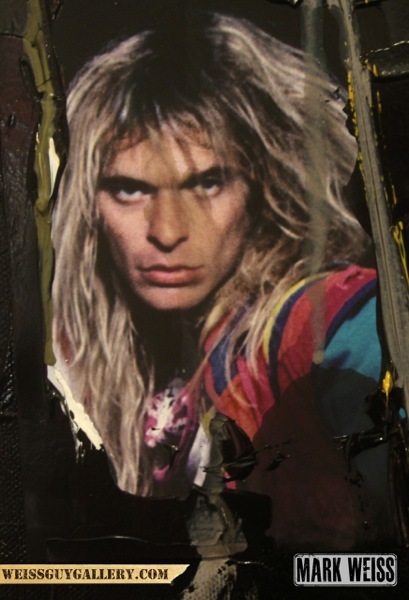 Since then, David has completed an Axl Rose painting from Mark’s 1987 photograph taken at the Ritz during Guns N’ Roses’ historic MTV concert. Axl signed the painting for Mark last week after playing the Ritz – 25 years later. The painting will be auctioned and all proceeds will again benefit MusiCares, the foundation established by the National Academy of Recording Arts and Sciences to provide emergency financial assistance to musicians who are in need. Since 1989 the foundation has provided a way for musicians to help others in the music community who may need help with addiction recovery, senior housing, medical and other personal issues.